Are you a Dotter? Dotters – members of online platform Dot-E – share a simple belief: each person you meet can change your life forever. 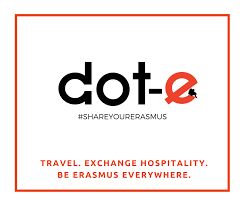 Dot-E is the first Erasmus traveler community in Europe. A community where all Erasmus students can meet and exchange hospitality during the many trips they undertake during the most beautiful year of their life. Matteo and Giacomo applied their studies to create a system based on values such as friendship, sharing and altruism and were recently invited by the president of European Parliament’s committee on Culture and Education, to present Dot-E as an innovative project in the field of culture creation and sharing. We spoke to Matteo Mirabella – former student of Business Administration at Tor Vergata University of Rome – to find out a little more about this successfull community of Erasmus travelers. UTV – Hello Matteo, will you tell us a little more about Dot-E ? “DOT-E is a system of solidarity between Erasmus and exchange students, providing support during their Erasmus and their travels. Registered users can search for a city and find all the Erasmus and former Erasmus students that are there. UTV – It’s such a simple and great idea: How did you come up with it? “It all started on a sunny day in Sevilla where my partner Giacomo (Calabrese) had just started his Erasmus: he decided he wanted to visit Cordoba, a beautiful city near Sevilla, but he didn’t know anyone who could join him, so he found a group on Facebook called “Erasmus in Cordoba” and wrote to all the members asking if someone was available to show him around the city. Unfortunately nobody read the message, because of Facebook’s Spam system filters all messages written by someone who is not a friend. UTV – What happened between the idea for Dot-E and the actual development of the platform? Giacomo wrote down a document with the first version of the idea, and he sent it to me: At the time I was living in Salvador de Bahia and I immediately tought it was amazing! We started creating the project while I was travelling between Brazil, Perù and Bolivia and he was living in Seville. We were in contact everyday with Erasmus students, and we started co-creating Dot-E with them, asking for feedbacks, ideas, critiques. After we graduated we won a grant from the Banca Popolare del Cassinate and Università degli studi di Cassino with which we financed the development of the beta version of our web app. We were selected also by SpeedMiUp to participate in their program of incubation of startups. So actually, we are now working with experienced people and we are learning and developing the platform as fast as possible. This is how we arrived in Bruxelles, invited by Silvia Costa, the president of European Parliament’s committee on Culture and Education, to present Dot-E as an innovative project in the field of culture creation and sharing. UTV – An incredible achievement. And now, what is the next step? We launched our first MVP (Minimum Viable Product) on December 10th: this is when we need to start understanding better our users, what they need and work on the interaction with Dot-E app. As soon as we find what is known as the “killer feature”, we will be ready to develop our mobile app. This is our objective and hopefully for us and for all Erasmus students it will happen very soon. UTV – You are a former student of Business Administration at our School of Economics: How did your study years at Tor Vergata contribute to your success? First of all I met many incredible, inspiring people during my studies at Tor Vergata: colleagues, professors and the staff of UTV. What makes Tor Vergata a great environment to study, i believe, is the large international network: I had the opportunity to live in Oviedo (Spain) in 2013/2014, then in Salvador de Bahia in 2016, and finally in Venice at VIU: These experiences were fundamental in my development both as a students and as a man. Travelling is the best way to become wiser person, so of course I’m grateful to Tor Vergata for offering me the opportunity to live these fundamental experiences. A special thanks goes to all the staff and coordinators that helped me during these periods, Susanna Petrini, Chiara Montanari and Chiara Tranquilli. UTV – What is your advise for younger students, do you have a receipt for success? If someone asked me for advice I would tell them: what is the first thing you think about when you wake up in the morning? Ask yourself what you really like, what you really want. Once you have an answer to these simple questions, everything will seem so much clearer! Never choose the easier option, always choose the most exciting one. And then, start to learn, on step at a time. And remember: don’t be scared of failing, because without failure there is no success.